After carrying out research in the food and drink sector for many years, it's part of our "bread and butter"! We are proficient at conducting taste tests, both in central locations and the home environment. Our in-house facilities, Innervisions, includes a mini prep kitchen enabling some food and beverage research on site, for example, within focus group discussions or quantitative hall testing. Foods and drinks tested are as diverse as yoghurts, chocolate, sweeties, chips, champagne, beers, soft drinks, noodles, sauces, meat and poultry. And we love it when there are, on occasion, 1 or 2 spares for the team to try also! Our teams, in-house and in-field, are equipped with the knowledge to deliver these tests safely and efficiently, whatever the research environment. Our newly installed sensory facility opens up further opportunities within certain food and beverage categories, with 10 open booths, designed and built to ISO sensory lab specifications, and 6 closed booths. Not all work in this sector involves eating and drinking! Many food and beverage studies focus on the development of the concept in its own right and the design of packaging, labelling, advertising and promotional materials. There may be a need to look at how a product fits within a category, against competing brands and products. Often a qualitative approach is adopted to fully appreciate the consumer perspective, review a range of alternatives and identify further avenues and generate new ideas. 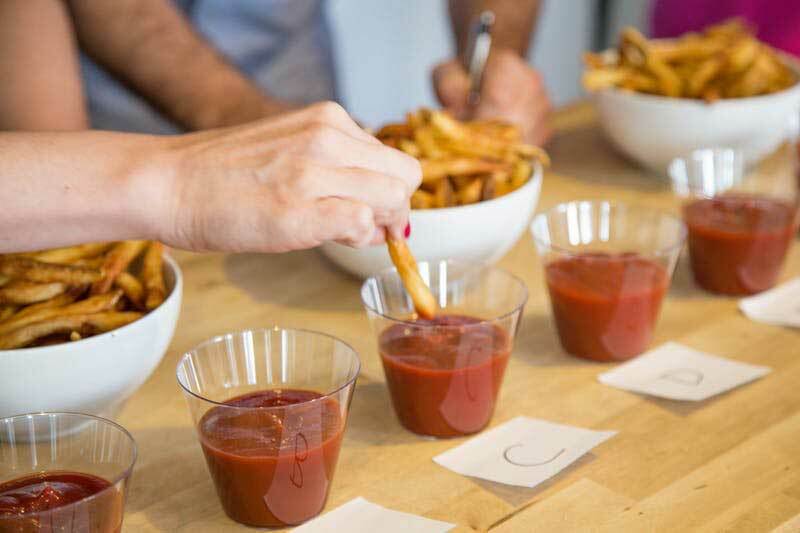 Prototypes and test designs can be closely reviewed within focus groups, workshops or depths and consumers may join a researcher for an accompanied shop, either on an individual basis or within a small group. This work may then be quantified through online surveys or face to face research in central locations, on street, in-store or in-home, to ensure proposals and changes are reviewed by a wider audience, relevant to the target market, before products are launched or packaging designs are finalised or claims are made within advertising.